Crystal Mountain Resort is known for its winter activities. Skiers and snowboarders flock the mountain each year to enjoy the slopes. 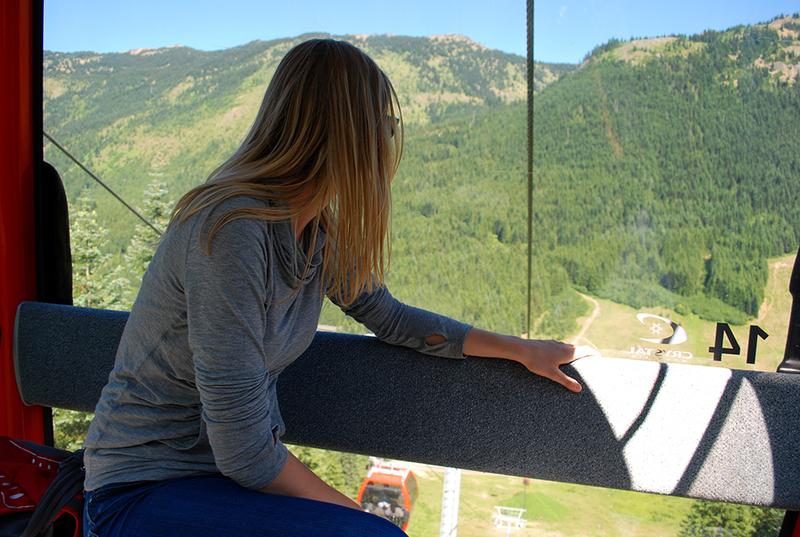 While it’s a great spot to visit during the winter, summer at Crystal Mountain Resort can be just as fun. 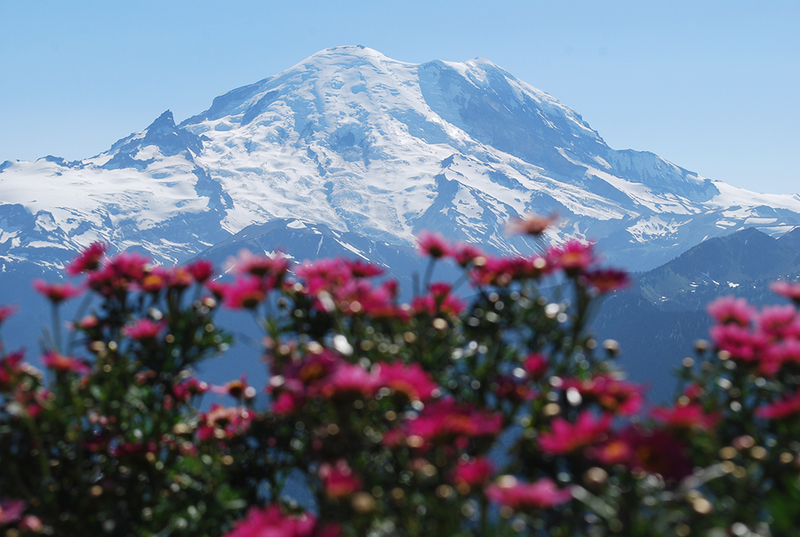 With plenty of outdoor activities and a close proximity to Mount Rainier, it’s a great weekend getaway from Seattle. If you’re not great with your geography (like me! ), Crystal Mount Resort is located southeast of Seattle and it’s about a two-hour drive from the city. The resort is also right next door to Mount Rainier National Park. It’s less than a 15 minute drive from the park entrance, making it the perfect location for people looking to spend a few days exploring the park. Tim and I stayed for a long, four-day weekend at Crystal Mountain Resort. We loved how easy it was to visit both Paradise and Sunrise visitor centers. The star attraction at Crystal Mountain Resort is the Mount Rainier Gondola. The roughly 10 minute ride takes you about 2,500 feet up (to an elevation of 6,800 feet) and drops you right in front of Mount Rainier. I mean right in front. While we were on the gondola, Tim and I first spotted Mount Adams in the distance. Thinking it was Mount Rainier at first, Tim was slightly bummed because he thought we’d be much closer to the mountain. Luckily, he was wrong. Just as we were cresting the top of Crystal, Mount Rainier showed itself and it was magnificent. It felt like we were looking at the mountain at eye level. It was really spectacular. 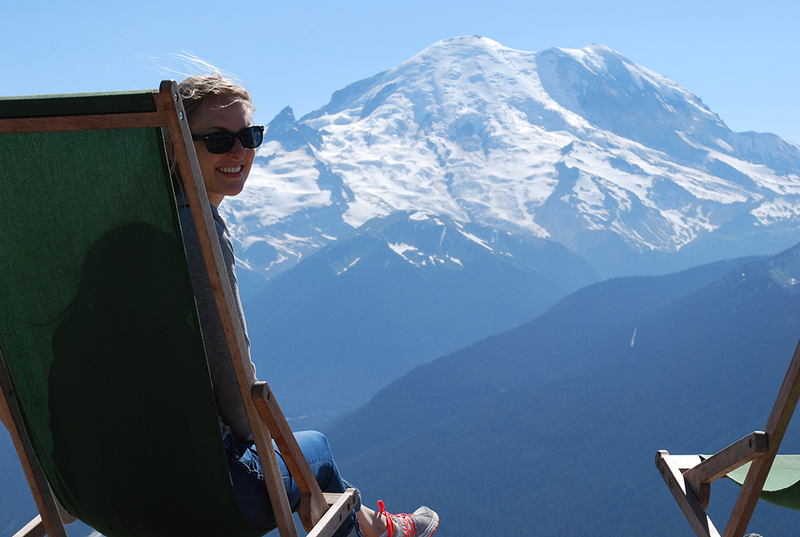 We spent around an hour taking in the view of Mount Rainier from the top of the gondola. We sat in lounge chairs on top of the summit, hung out with some extremely friendly chipmunks, and just enjoy ourselves. It was perfect. Also at the top of the Mount Rainier Gondola is the Summit House Restaurant. As the highest elevation restaurant in Washington (sitting at 6,872 feet), the views are awesome. 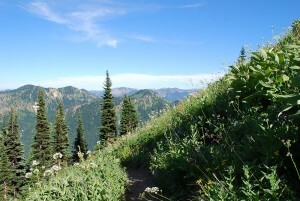 In one direction, you look at the forest of Crystal Mountain and the other direction you see Mount Rainier. Crystal Mountain Resort was kind enough to provide a gift card for our meal. We enjoyed everything we ate, but the highlights included the Summit House Fish & Chips, and a Bloody Lumberjack, which is a huge Bloody Mary topped with bacon, a prawn, a pickle and more. While you can easily take the gondola down the mountain, you can also hike down, which is exactly what Tim and I did. There are several different trails that wind you around the hills and back to the base of the mountain. One of the most popular routes down leads you to a few lakes. Grab a trail map at the base of the mountain when you purchase your ticket. 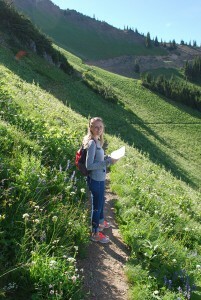 The staff is friendly and will happily offer advice on what hikes are their favorite. On your way down the mountain, you may also notice a 36-basket disc golf course. Discs and maps are available at both the top and bottom of the gondola. 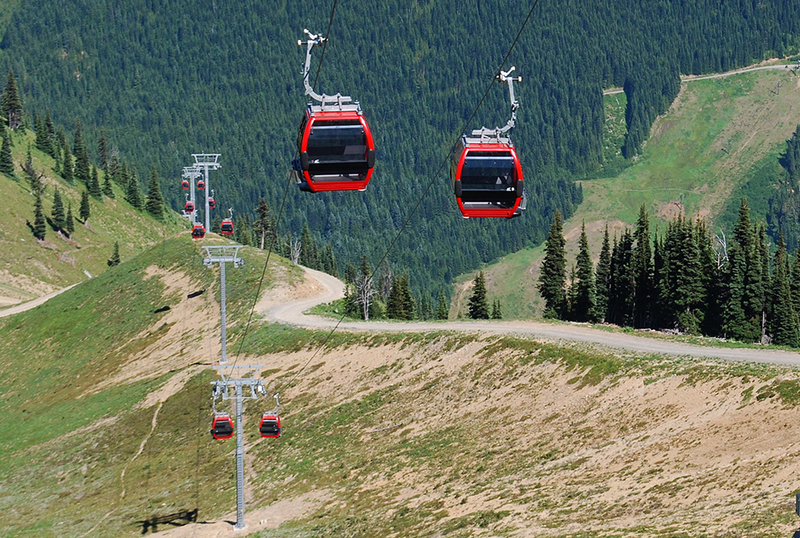 Editor’s Note: It costs $22 per person to go up the gondola, but the ride down is free. 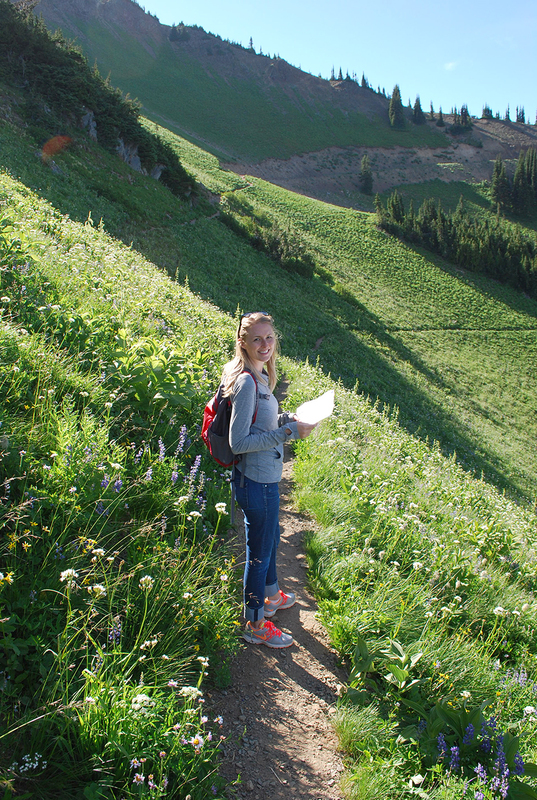 So if you’d rather hike up the mountain, you can enjoy the ride down free of charge. Check out the Crystal Mountain Resort website for a full list of ticket prices. There are a few different places to stay when you visit Crystal Mountain Resort. We stayed at Crystal Mountain Hotels. The room was pretty basic but it was just what we needed as a “home” to explore the resort and Mount Rainier National Park. The rooms were also discounted because the summer is considered the off-season. Check out other lodging options by visiting the Crystal Mountain Resort lodging partners webpage. 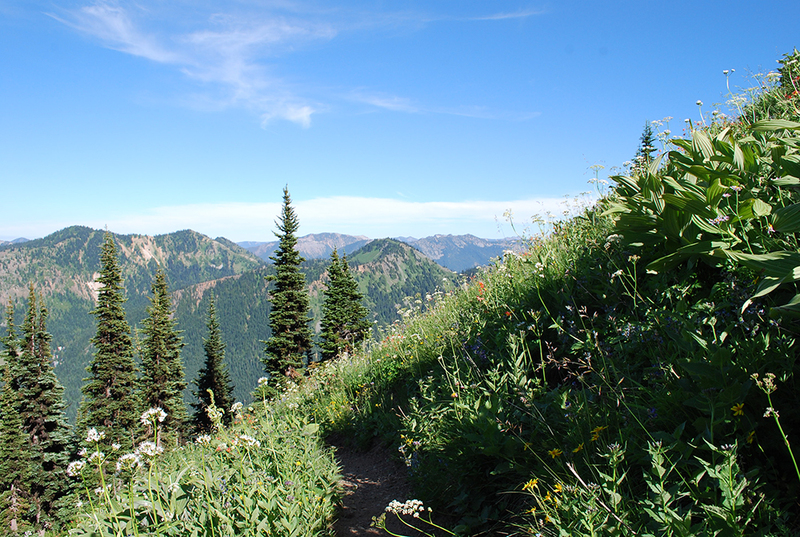 Editor’s Note: It’s pretty secluded at Crystal Mountain Resort (which is something we love!) but that means there aren’t a lot of dining options. In addition to the Summit House, the resort also has a small store called The Market that sells pre-made sandwiches and snacks, and the All American Lunch Box food truck that serves lunch on the weekends. Breakfast and dinner spots are hard to come by, though. Crystal Mountain Hotels offers the Alpine Inn Restaurant and the Snorting Elk Cellar. The menus are the same at the restaurant and bar and the food is overpriced, especially for what you’re served. We recognize that it all comes down to supply and demand, but we think it’s something to keep in mind as you budget for your trip. 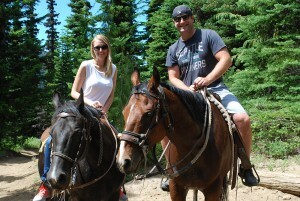 While at Crystal Mountain Resort, Tim and I also went on a horseback ride. Each summer, the resort offers rides to visitors. You can go on a one hour ride ($35 per person) or two hour ride ($70). Tim and I opted for the one hour ride and had so much fun. We’ve both been on horses, but only as kids. Our guide was from South Dakota and grew up on horses. She was super sweet and kept us entertained along the ride. They seemed very accommodating and didn’t mind that we made a last-minute reservation. The thing we loved most about our trip to Crystal Mountain Resort was how far away from the city we felt and also how easy it was to get there. It was so wonderful to spend a few days in the woods, enjoying the outdoors and each other’s company. We’re already planning another tip, likely during the winter so we can experience the resort with a different lens. Have you ever visited Crystal Mountain Resort? How about a visit during the summer? We would love to hear from you! Leave us a comment or connect with us on Twitter, Facebook and Google+. Don’t forget to also visit Seattle Bloggers for more awesome places to experience in and around Seattle.